On my second day in Kyoto, my agenda was very ambitious, with 6 temples and shrines to see. The first one I visited was Kiyomizudera, one of the most famous temples in Japan. On my second day in Kyoto, my agenda was very ambitious, with 6 temples and shrines to see. The first one I visited was Kiyomizudera, one of the most famous temples in Japan. The name of the temple means “Pure Water Temple”. The temple contains a fountain which is said to give visitors luck in different areas depending on which stream they drink from. Temples are a popular place for school field trips and I saw several groups at this temple that morning. 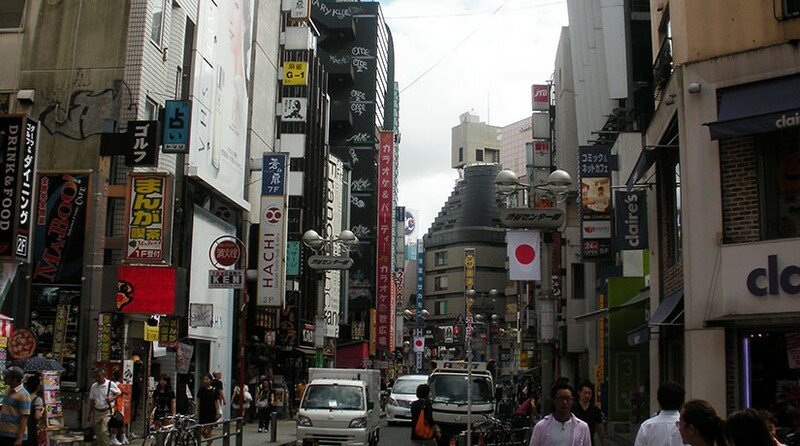 I have gone through quite a bit about one of the most popular districts in Tokyo, Shibuya. From wandering Center Gai to the Shibuya shopping experience and Yoyogi Park, you can easily spend a full day there and feel like you have a lot more to see and do still. 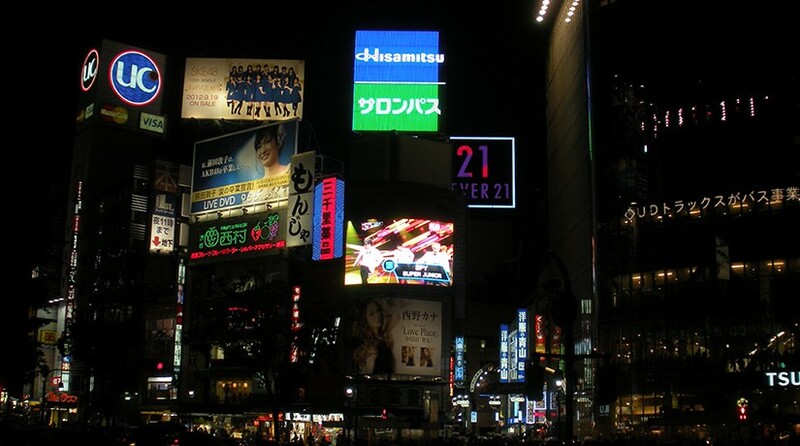 But one of the most spectacular sights you can see while in Tokyo is Shibuya at night. 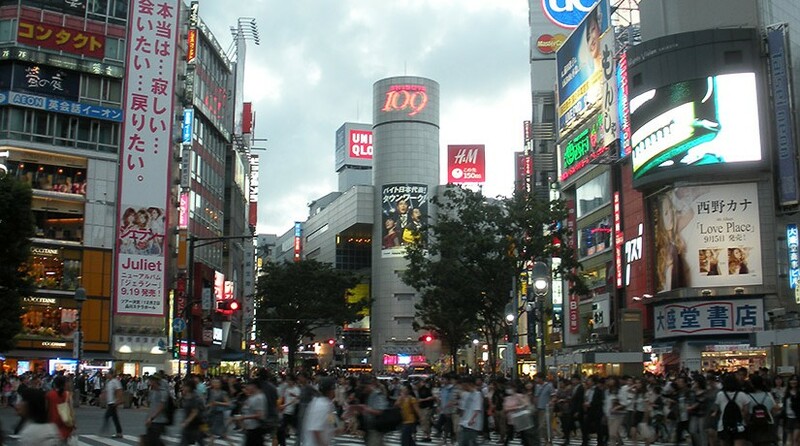 Tokyo is famous for its neon glow in the evening and Shibuya is one of the areas where this is most impressive. This is one of my favorite views in Shibuya. The 109 building is very iconic. 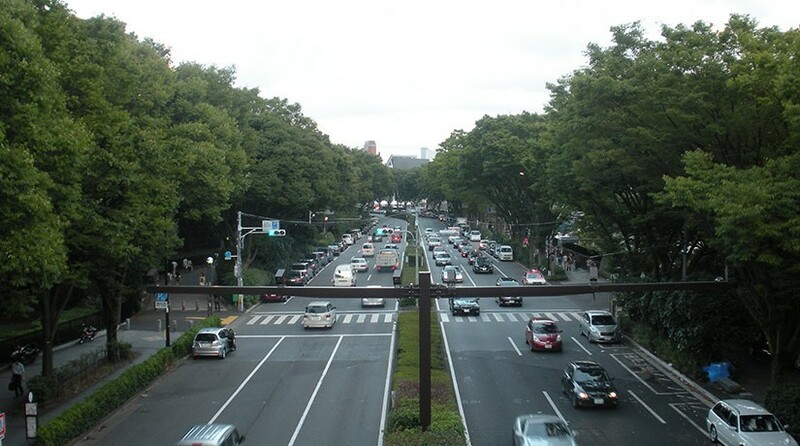 Not a far walk from Shibuya’s shopping district is Yoyogi park. 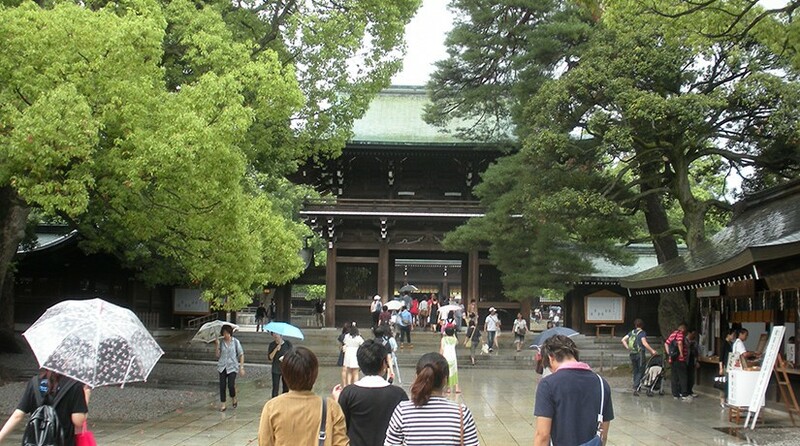 It is one of the largest parks in Tokyo and is also near Meiji Shrine and Harajuku Station. While making my way to the park, I came across a large group of people gathered outside the NHK Hall for a concert. I’m not sure who the singer was but I know it was a J-pop idol. The thing I found funny was that nearly all of the fans were wearing the concert T-shirt. That is not really something you see in America on a level like this. There were several fans dressed up in cosplay outfits for the concert even, both guys and girls. After people watching for a little bit, I continued on to check out the park. One of the areas of Tokyo I was most excited to visit during my trip was Shibuya. Shibuya is known as the fashion and shopping district of Tokyo, and is also a popular nightlife spot. One of the areas of Tokyo I was most excited to visit during my trip was Shibuya. Shibuya is known as the fashion and shopping district of Tokyo, and is also a popular nightlife spot. The area around Shibuya station is often what people think of when they think of Tokyo, with its scramble crossing and large TV screens and numerous other advertisements. It has even been likened to Times Square in New York City. Both of these ads were all over Tokyo. I probably saw more pictures of Tommy Lee Jones than I have the rest of my life. This statue is of a dog called Hachiko. The story behind it says that the dog waited loyally outside this entrance of Shibuya Station every day for his master, and for years after his masters death. Today it is a very popular meeting place, and the station entrance nearby has been named after Hachiko. My last stop on day 3 of my trip was to Meiji Jingu Stadium in Shinjuku to check out a Japanese baseball game. The home team at this stadium is the Tokyo Yakult Swallows, part of Nippon Professional Baseball (NPB), akin to the MLB in the US. One difference between baseball in Japan and in America is that in Japan, corporations own the professional baseball teams while in America, they are their own corporate entities. Yakult is the company that owns the Swallows. 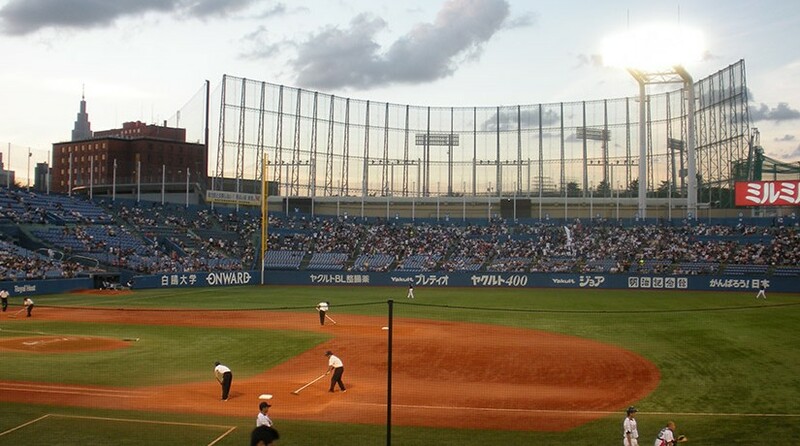 Baseball in Japan is probably the country’s most popular sport. The most well known team in Tokyo is the Giants, but I decided to see the Swallows because of their outdoor stadium, because the Giants play at the indoor Tokyo Dome. Even though the Swallows are a pro level team, their stadium is more comparable to a US minor league team in size. Because of this, I had pretty good seats at an affordable price. I paid ￥3,600 for my seats along the first base line, though tickets go as cheap as ￥1,500 for unreserved outfield seats. After exploring Harajuku and walking down Takeshita Street, I headed to Meiji Jingu, the shrine dedicated to the spirits of Emperor Meiji and his wife Empress Shoken. After exploring Harajuku and walking down Takeshita Street, I headed to Meiji Jingu, the shrine dedicated to the spirits of Emperor Meiji and his wife Empress Shoken. The entrance to the shrine can easily be found right next to Harajuku Station. 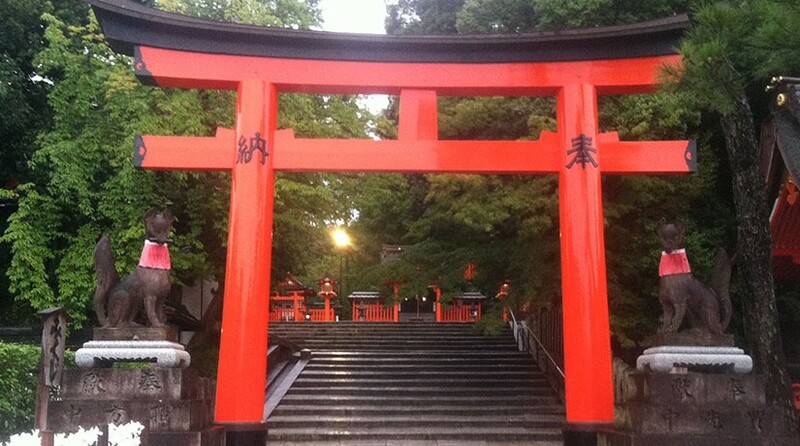 The shrine is located in a large forest area, with a huge torii gate marking the entrance. There is a long main road you can walk down to see the actual shrine, and there is also a side path with a kept garden are and pond, where you must pay for entry. The shrine itself is free to visit though. Harajuku is the area in Shibuya ward near Harajuku Station known for several things: numerous high school girls, occasional cosplayers, and shopping on the crowded Takeshita Dori (Takeshita Street). Harajuku is the area in Shibuya ward near Harajuku Station known for several things: numerous high school girls, occasional cosplayers, and shopping on the crowded Takeshita Dori (Takeshita Street). Sunday is the day known for attracting cosplayers to the area, so I chose that day to visit. Unfortunately, there were very few to be found, possibly due to the cloudy conditions that morning, and rain later in the day. However, great people watching still took place, as Harajuku attracts all kinds of fashionable and trendy people to the area. Cosplayers aside, the main attractions for me at Harajuku were taking a stroll down Takeshita Dori and visiting Meiji Jingu (Meiji Shrine). Takeshita Dori is a pedestrian only street which becomes absolutely packed on the weekends, and is also popular in the afternoon once school gets out. 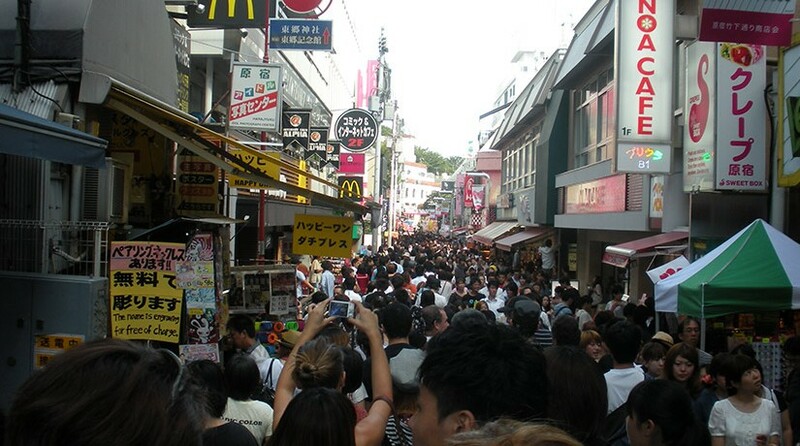 The street is filled with filled with cafes and restaurants, fashion and accessory stores, and idol goods. Shopping is one of the main attractions to visit Harajuku, even outside of Takeshita Dori. Popular stores include Kiddy Land, which is one of the largest toy stores in Tokyo, Louis Vuitton, Tokyu Plaza, and more.